« EU leaders to ‘prepare for the worst’ in EU-US relations: New World Order? Some have wondered if the 6000 years God allowed humans to rule themselves is almost up, why do most of the Jews claim we have over two centuries to go? Well, according to what several have concluded, it was essentially the result of a Jewish coverup! At the Feast of Trumpets, which they normally call Rosh Hashanah, Jews proclaim a New Year. The current one from sunset September 20, 2017 to September 9, 2018 is year they call 5778 or 5778 AM (anno mundi). The Hebrew calendar year 6,000, 222 years from now, marks the end of the age of the Messiah but scientist Saul Kullook, has calculated a different date, potentially bringing redemption much closer. As a preface to Kullook’s latest discovery, he cited the Talmud (Tractate Avodah Zarah 9a) which states that the world will last for 6,000 years. This is broken down into three periods: for 2,000 years, the world stood empty, for 2,000 years the world existed “in Torah”, and the final 2,000 years will be the age when the Messiah may come, depending on mankind’s actions. At the end of the 6,000 years, the Messiah must come, even if mankind has not prepared itself. Kullook explained how the Seder Olam Rabbah came to this conclusion. “Torah sources are in agreement that the biblical Exodus took place in the year 2,448 according to the Hebrew Bible chronology. After that, there were 480 years until the First Temple was built,” Kullook said, citing the Book of Kings. Kullook went on to describe the timeline. Stated simply, Kullook discovered that if you base the end of times, scheduled to arrive in the year 6,000 according to the current Hebrew Calendar which places the destruction of the First Temple in 442 BCE, the age of Moshiach will last until 2,240 CE. But if you base the end of times on a date of destruction of the First Temple in the historically accurate 586 BCE, the year 6,000 of the Hebrew chronology falls in 2076 CE. Well, it is actually later than that as the numbers do not add up with scripture. But before getting to that, let me state that according to that Talmud citation from Saul Kullook, the Messiah was to come about 2000 years ago, and Jesus did. Anyway, I have heard various explanations of why the ‘official’ Jewish count of the age of the world is off. Perhaps the most common is that a Rabbi did a calculation once, made a possibly deliberate error in a book called the Seder Olam over 1800 years ago and everyone kept following it. Though many keep following it, many Jewish scholars realize that it contained errors. The numbers in the Bible are much clearer and I do not believe that they would be off for over 200 years because of overlapping reigns, differences in birth dates, etc. Plus, the 6000 years should be up in the next decade or so. There is also a 1997 book written by an attorney and Orthodox Jew titled Jewish History in Conflict: A Study of the Major Discrepancy between Rabbinic and Conventional Chronology with detailed explanations that tries to resolve much of this. Basically, according to a reviewer (http://www.lamblion.com/articles/articles_jewishlife3.php viewed 04/02/12), the book suggests that there was a misunderstanding about certain Persian kings and Daniel 9:24-27 and that this error was carried forward. The book’s author, Michael First, essentially shows that the current Jewish chronology is flawed and that something closer to the conventional chronology (like the article Does God Have a 6,000 Year Plan? What Year Does the 6,000 Years End? uses) is the correct one. 6. The gravity of this intellectual dilemma posed by such enormous discrepancies must not be underestimated. The unsuspecting students — including the pupils of our Yeshivoth and Beth Jacob High Schools — are faced with a puzzle that appears insoluble. How could it have been that our forebears had no knowledge of a period in history, otherwise widely known and amply documented, which lasted over a span of 165 years and which was less than 600 years removed in time from the days of the Sages who recorded our traditional chronology in Seder Olam? Is it really possible to assume that some form of historical amnesia had been allowed to take possession of the collective memory of an entire people? This should be quite like assuming that some group of recognized historians of today would publish a textbook on medieval history, ignoring all the records of, say, the thirteenth and fourteenth centuries of the Common Era. Would this not seem inconceivable even for those who, unfortunately, do not possess the necessary emunas chachomim to accept the world of our Sages? 4. The Torah-true historian is now confronted with a truly vexing problem. Ancient history of the Babylonian and Persian Empires presents us with completely different data. These figures can hardly be doubted for they appear to be the result of painstaking research by hundreds of scholars and are borne out by profound erudition and by ever increasing authoritative evidence. Sometimes small discrepancies of a year or tow at the most have yet to be accounted for, but complete agreement seems to be almost within reach at the present time…. Since according to Ezra (6:15) the Second Temple was completed in the sixth year of Darius I, the date following the secular chronology must have been 517 BCE; i.e., exactly 70 years after the date (again, established by secular historians) for the destruction of the First Temple (587 BCE). Consequently the first year of the era of the Second Temple was 517 BCE and not 351 BCE. As long as we cannot doubt the date given for the destruction of the Second Temple (70 CE) we are compelled to admit that the Bayis Sheini must have existed for no less than 586 years instead of the 420 years given by tradition. This amounts to a discrepancy of over 165 years compared with our Jewish way of reckoning! Perhaps it should be noted that allegedly a formal retraction of his “coverup theory” appeared in Schwab’s volumes of “Selected Writings” – but he insisted that even though the explanation was not tenable the problem remained. Furthermore, the shortening as perpetuated in the Sedar Olam was deliberate! This is an astonishing proposal. Schwab, along with other Jewish commentators, further suggests that the reason why God directed the sages of the 2nd century AD to become involved in falsifying the data was to confuse anyone who might try to use the prophecies of Daniel to predict the time of the Messiah’s coming. This was supposedly done to honour Da 12:4: “shut up the words, and seal the book, even to the time of the end.” He adds that the reason the sages had adopted the non-Jewish Seleucid Era calendar was part of a scheme to do just that–to close up the words and seal the book of Daniel. Schwab also states that if the 165 years were included it would reveal “we are much closer to the the end of the 6th Millennium than we had surmised.” (Schwab mentions this date as the time when many rabbis expect Messiah to come.). But can any sincere reader accept such a flimsy reason as justification for distorting history? It actually accuses God himself of perpetrating a dishonest deception. how be made to apply to the century after the life of Christ. Then it would be possible for the rabbis to point to another messiah who, as circumstances would have it, was cut off in death some 100 years after the crucifixion of our Lord. The 10th day of the month Ab (c. mid-August) is a great day of sorrow to Israel. On this day in 588 BC, the Babylonians destroyed Solomon’s Temple. Further, the second temple was laid waste by the Romans under Titus on the same day in 70 AD. And on this very day in 135 AD, at the conclusion of a 3 1/2-year revolt, the Romans crushed the army of the “messianic” Simon Bar Kokhba (also spelled “Cocheba”). In his 98th year, Akiva was eventually imprisoned and condemned to death by the Romans. Among the many accolades heaped upon Akiva, that which elevated him as a pre-eminent authority, was the acknowledging of him as “the father of the Mishnah.” Such prominence gave great weight to the messianic expectancy Akiva placed upon Bar Kokhba. Akiva’s students became some of the most prominent sages of the following generation. Among these was Yose (Josi) ben Halafta. Akiva’s influence on Halafta is apparent from a statement made concerning his education; it was merely said that Rabbi Akiva had been his teacher. As his mentor Akiva’s regard for Bar Kokhba would have been thoroughly imbedded in Yose. 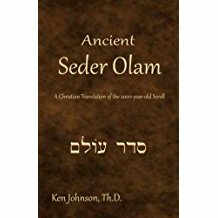 The preceding overview explains why the Seder Olam is held in such veneration and why the Jews still use it for their national dating. Yet the fact remains that it is a dishonest attempt to conceal the truth with regard to the Da 9:24-27 prophecy. Many peoples have chosen to rely on lies, sometimes called tradition (though not all traditions are based on lies), instead of acting on the truth. Many Jewish scholars realize the errors in the Seder Olam (First M. Jewish History in Conflict. Jason Aronson, Inc. Jerusalem, 1997, pp. 44-80), and several admit that the errors seemed to be to affect the interpretation of Daniel 9:24-26 (ibid). According to Michael First, some of the modern Jewish scholars in the latter category appear to include Hayyim Shvilly (ibid, p. 70), Benny Isaacson (p. 71), Ben Zion Wacholder (pp. 73-74), Jay Braverman (p. 74), Joseph Tabori (pp. 76-77), and Henry Guggenheimer (p. 78). Berel Wein is said to have admitted that “the Jewish way of counting is off 166 years” (p. 78), whereas Samuel Hakohen admitted that Jewish sages provided an incorrect chronology “to accurately predict the time of the coming of the Messiah” (pp. 78-79). Michael First also lists Jewish scholars in the 8th through 15th centuries (such as Pirkei De-Rabbi Eliezer, Josippon, Moses ben Samuel ka-Kohen Gikatilla, Rashi, Zerahiah ben Isaac ha-Levi Gerondi, Abraham ben David ha-Levi Ibn David, David Kimhi, Samuel ben Nissim Masnut, Isaac ben Joseph Israeli, Isaac Abravanel) who had problems and/or wrote in contradictions related to one or more parts of the Jewish chronology of the Seder Olam (pp. 183-198). Michael First reported that Jewish Rabbi Simon Schwab said that the 165 years could be related to ‘Daniel’s secret’ (cf. Daniel 12:9) as the gematria (Gematria /ɡəˈmeɪ.tri.ə/ originated as an Assyro-Babylonian-Greek system of alphanumeric code/cipher later adopted into Jewish culture that assigns numerical value to a word/name/phrase in the belief that words or phrases with identical numerical values bear some relation to each other or bear some relation to the number itself as it may apply to Nature, a person’s age, the calendar year, or the like. Source: Wikipedia 09/24/17) is 165, even though it is more like 168 or 169 years that was changed (First M. Jewish History in Conflict: A Study of the Major Discrepancy between Rabbinic and Conventional Chronology. Jason Aronson, Inc., 1997, p. 75). Samuel Kedar makes the same suggestion as Schwab. He writes that the Sages purposely stated an incorrect chronology in order to prevent people from using their chronology to accurately predict the timing of the coming of the Messiah. In certain instructions given to Daniel, the Sages saw a divine command to obscure a part of the Persian period. … Kedar even includes the same gematria as Schwab … equals 165 (First M. Jewish History in Conflict: A Study of the Major Discrepancy between Rabbinic and Conventional Chronology. Jason Aronson, Inc., 1997, p. 67). 6. When therefore the generals of Antiochus’s armies had been beaten so often, Judas assembled the people together, and told them, that after these many victories which God had given them, they ought to go up to Jerusalem, and purify the temple, and offer the appointed sacrifices. But as soon as he, with the whole multitude, was come to Jerusalem, and found the temple deserted, and its gates burnt down, and plants growing in the temple of their own accord, on account of its desertion, he and those that were with him began to lament, and were quite confounded at the sight of the temple; so he chose out some of his soldiers, and gave them order to fight against those guards that were in the citadel, until he should have purified the temple. When therefore he had carefully purged it, and had brought in new vessels, the candlestick, the table [of shew-bread], and the altar [of incense], which were made of gold, he hung up the veils at the gates, and added doors to them. He also took down the altar [of burnt-offering], and built a new one of stones that he gathered together, and not of such as were hewn with iron tools. So on the five and twentieth day of the month Casleu, which the Macedonians call Apeliens, they lighted the lamps that were on the candlestick, and offered incense upon the altar [of incense], and laid the loaves upon the table [of shew-bread], and offered burnt-offerings upon the new altar [of burnt-offering]. Now it so fell out, that these things were done on the very same day on which their Divine worship had fallen off, and was reduced to a profane and common use, after three years’ time; for so it was, that the temple was made desolate by Antiochus, and so continued for three years. This desolation happened to the temple in the hundred forty and fifth year, on the twenty-fifth day of the month Apeliens, and on the hundred fifty and third olympiad: but it was dedicated anew, on the same day, the twenty-fifth of the month Apeliens, on the hundred and forty-eighth year, and on the hundred and fifty-fourth olympiad. And this desolation came to pass according to the prophecy of Daniel, which was given four hundred and eight years before; for he declared that the Macedonians would dissolve that worship [for some time]. (Josephus. Antiquities of the Jews. Book XII, Chapter 7, Verse 6). According to the date assigned to the reign of Darius the Mede as beginning 374 B.C. (per the interpretation of Pierce L, Pierce M, editors. The Annals of the World. Master Books. Copyright 2003, p. 932), and since Antiochus is well known to have made that destruction in 167 B.C., there is over a 200 year difference here. And although Josephus may himself have too much time (that is hard to determine as the first year of the reign of Darius the Mede is debated, though more often presumed to be in the 6th century B.C. instead of the 4th century B.C. as the Seder Olam seems to point to). Thus, this reduction of time seems intentional in the Seder Olam, and likely is related to the rise of Christianity as the Seder Olam, did not come out until a generation after Josephus. Speaking of Josephus, it has been speculated that one of his writings (Contra Apion, I, 8) support the view that the Jews tried to minimize the importance of the Book of Daniel (Derstine T. Anti-Messianic Basis of Jewish Chronology. Are We Living in the Year 5770? Persian Chronology in the Seder Olam. 2009; see also The Original Order of the Books of the Bible). Yes, Bar Kochba was not the Messiah, but believing that he was (and that Jesus was not) seems to have influenced the ‘dating of the world.’ Akiva actually changed Bar Kosiba’s name (suggesting he was a disreputable son) to Bar Kochba, which for a time, seemed to prolong the myth he was Messianic. Yet because of their ‘greatest sages,’ Akiva tried to make others believe Bar Koziba was really the Messiah, many Jews seemed to accept/make calculation changes. Yet, irrespective of why any of this may have happened, the fact is that the Jewish year is off by around 200 years compared to historical records and the biblical account. Secondly, we learn that the Messiah could have arrived to redeem us and bring us all to Israel as early as the year 4000 in the Hebrew calendar (which corresponds to the year 240 CE in the Julian calendar). Unfortunately, since we haven’t been good boys and girls, it is already the year 5773 and the Messiah still hasn’t shown up! Most importantly, we learn that the Messiah has to come before the year 6000 – which means that he will definitely arrive within the next 227 years! Who knows, if we don’t get to see the Messianic Era, maybe our children or grandchildren or great-grandchildren will! The truth is that we might be closer to witnessing the Messianic Age than we think. You see, there is a major chronological discrepancy between rabbinic chronologists for the destruction of the First Temple in 423 BCE and the modern secular dating for it in 586 BCE – a difference of 163 years! Well, that is closer to the right amount (as well as closer to that done by Saul Kullook), but that is still off. The explanation for why the claim that Messiah did not come 1900 years ago, of course, is wrong. Jesus did come, but He was rejected (cf. 1 Peter 2:4). It has been taught; R. Nathan said: This verse pierces and descends to the very abyss: For the vision is yet for an appointed time, but at the end it shall speak, and not lie: though he tarry, wait for him; because it will surely come, it will not tarry. Not as our Masters, who interpreted the verse, until a time and times and the dividing of time; nor as R. Simlai who expounded, Thou feedest them with the bread of tears; and givest them tears to drink a third time; nor as R. Akiba who expounded, Yet once, it is a little while, and I will shake the heavens, and the earth: but the first dynasty shall last seventy years, the second, fifty two, and the reign of Bar Koziba two and a half years. Consider that the Babylonian Talmud dates from the 3rd to 5th centuries. By that time, some in Judaism realized, apparently based upon their improper understanding of Habakkuk 2, Daniel 9, and other materials, that the Messiah should have already came. Of course, Jesus did come (see The KEY To The Crucifixion Date which goes into more depth about Daniel 9), but they would not accept Him. It should be noted that Jewish rabbis have generally decided to teach that the Messiah would come at/by the end of 6,000 years (as opposed to their earlier view of 4,000 years). Unless more Jews change their view of the chronology, many will believe that when Jesus returns, it will be too early, and thus once again deny Christ. As far as what some Jews and others thought about the first century A.D. for the Messiah, check out the article Was there an expectation among Judaism for a Messiah around the time of Jesus? Was there an expectation among Judaism for a Messiah around the time of Jesus? Is there any evidence that any Jews expected a Messiah when Jesus arrived? Does God Have a 6,000 Year Plan? What Year Does the 6,000 Years End? Was a 6000 year time allowed for humans to rule followed by a literal thousand year reign of Christ on Earth taught by the early Christians? Does God have 7,000 year plan? What year may the six thousand years of human rule end? When will Jesus return? 2026 or 20xx? There is also a video titled The 6000 Year Plan: Is the end of humanity’s reign almost up? Here is a link to the article in Spanish: ¿Tiene Dios un plan de 6,000 años? Should You Observe God’s Holy Days or Demonic Holidays? This is a free pdf booklet explaining what the Bible and history teach about God’s Holy Days and popular holidays. A related sermon is Which Spring Days should Christians observe? This entry was posted on Thursday, June 28th, 2018 at 2:20 pm	and is filed under Prophecy, Religious News. If the 6000 years is almost up, why do the Jews claim it is 5778? ‘In the Hebrew Year 5778, Israel Celebrated Its 70th Anniversary. What Will 5779 Bring?’ Well, it is later than they think. BibleNewsProphecy: Jewish Year 5779 or 5990?